I have always, for as far back as I can remember, been interested in death. I love cemeteries, especially the old historical ones with those huge honkin’ angels. I was told in high school that I was obsessed with death, which became one of the defining moments in my life. My interest in and acceptance of death often makes people uncomfortable, but I continue to try and change people’s negative feelings toward death and dying, and am passionate about us reclaiming our sacred tradition of caring for our own dead. I came to this work of natural death care easily once I found my tribe: the National Home Funeral Alliance. I received training through the “Beyond Hospice” online course, as well as during practical training for after death body care at many workshops. I would agree that this work is a calling, a ministry even. I adore the word “psychopomp” and Mexican sugar skulls. My husband and I have been hosting a “Day of the Dead” party for almost ten years, reminding our family and friends about the importance and beauty of holding our beloved ancestors in Present time. I grew tired of waiting for someone to start a local Death Café, so just decided to do it myself in 2014! 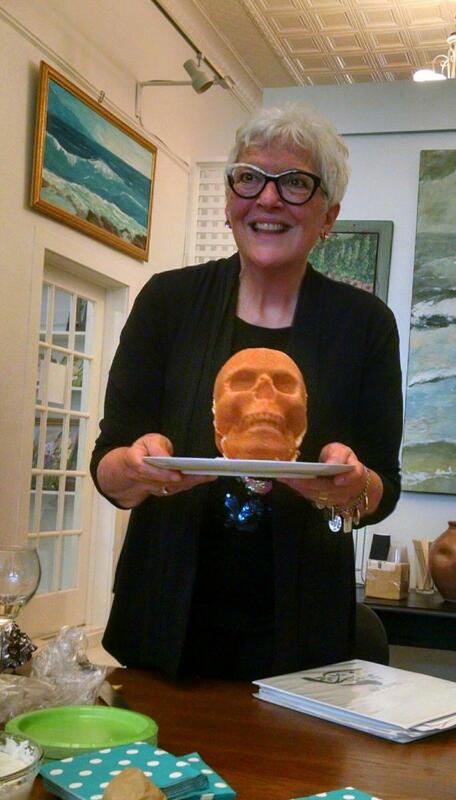 Death Café MEBANE is still growing strong and I continue to serve as Host. I served on the Board of Directors of the National Home Funeral Alliance from 2014-2017, and am Director of my local Funeral Consumers Alliance chapter (FCA-Piedmont). I am a trained home funeral guide and a hospice volunteer. I am also a Certified InSight Funeral Celebrant.